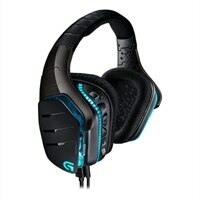 G633 Artemis Spectrum is a gaming headset worthy of serious audio fans. G633 Artemis Spectrum gaming headset is engineered with advanced Pro-G audio drivers for immersive surround sound. A foldaway boom mic delivers crystal clear communication. Access all your controls remotely - audio, lighting or programmable macros - right from your headset. Personalize your G633 with swappable backlit custom tags and customize the lighting from a palette of up to 16.8 million colors. Connect two audio devices simultaneously and answer calls, play music and more while in-game. Create custom sound profiles with the on-board equalizer.